Are you a busy mom?? Do you KNOW that strict diets are NOT the answer but you just aren’t sure what to do next? Do you WANT to be a healthy example to your kids? Do you want more energy and to feel confident in your postpartum body? 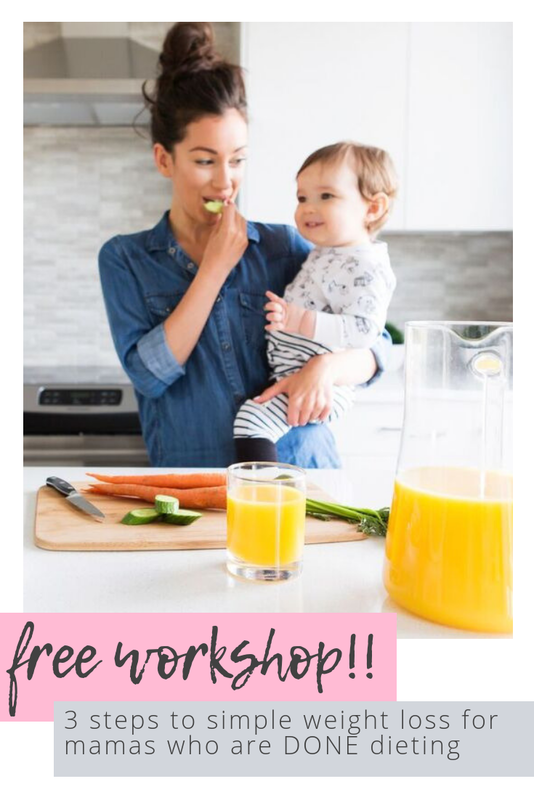 Check out this free intuitive eating workshop! click here to access the free workshop! I know working on your health and fitness is sometimes easier said than done. But I also know a little accountability and a plan can go a long way. That's why I'm offering the FREE 5-day healthy mama kickstart challenge! It's perfect if you feel like you've been struggling with health habits that used to be easy for you, or if you just need a good re-set! One habit per day, no commitment or crazy plan to stick to. Easy as that. Sign up by clicking here and be sure to join my free facebook community by clicking here!! I was interviewed on the Mara & Megan Show a couple months ago and my episode went live this week! I talked all about postpartum body image, life as a new mom, and changing habits by going back to basics. As much as I hate to admit it, fall is coming and summer is winding down. I'm not ready for summer to end! But since it's back to school time (and a good time to go shopping, wink wink), I thought I'd share a few cute fall-ish items that are available now. I'm loving pale pink with army green (and of course gray and black because I'm boring). And there are so many cute casual tennis shoes out now too! I live in leggings all fall and winter (but let's be honest...kind of all year long). But comfy doesn't have to be frumpy and boring! I love the look of leggings with a tank and a long cardigan in the fall. These items are perfect for going from the gym straight into #momlife. In honor of my precious girl’s first bday, I’m talking year one of motherhood. I’m sure every mom has the same feeling, but holy crap the time has gone so fast. I look back and while, in the moment some months seemed to drag on (I’m looking at you, 4 month sleep regression), it really is a huge whirlwind of ALL THE FEELINGS. So today I will share a few things I’ve learned ...because really, there are too many to count... and a few things I wish I knew before my precious Elle was born. Things don’t go as planned. I remember specifically when Elle was about a month old and I was taking a trip with she and my mom back to my family’s house in San Diego...I was trying to make a plan in my head of where we could stop on the way and how often we should stop so I could nurse, and I realized WTF am I thinking. She’s going to tell me when she needs to stop to eat or needs a diaper change. It doesn’t matter when I “think we should”. SO JUST STOP WORRYING ABOUT IT. Yes, I’m a huge planner, but the best thing I’ve done is realized that sometimes I just need to let it go. Elle is in charge now lol. Sleep Deprivation is real and it’s ugly. OMG. We went through phases where Elle would sleep great, and then she would be up and down allll night. And omg I did not anticipate the gnarly effect sleep deprivation would have on my body. I feel like I aged a good 5 years, plus lack of sleep totally contributed to more headaches along with all the other things like feeling like I’m stuck in a fog and need to sleep for a week straight. One year later, and she’s sleeping much better now (knock on wood) but seriously. It was rough there for a while. Even though I read many books and articles about sleep training, I somehow failed to account for the fact that this little babe is a HUMAN who won't just sleep because I give her the right environment, etc. She has needs, and feelings, and sometimes just doesn't know what she wants. Just like me. Babies make marriage complicated. My husband and I were married for 5 years before Elle was born. When I was pregnant I kept reading that pregnancy made marriage hard, and I honestly felt closer and more connected than ever to my husband. But after the baby was born. Wow. It was hard. My husband was on crutches the first month of Elle’s life (long story), he helped as much as he could, but because of that combined with me breastfeeding Elle 24/7 (not really, but it felt like it), he just didn’t have the opportunity to get used to everything as quickly. I think it’s normal that mom’s just figure it out out of necessity, but sometimes it’s just harder at first for dads. They don’t necessarily have that immediate bond that mamas and their babies do. It’s complicated for sure, and it took us months to find our groove as a family. My husband absolutely loves being a dad and helping me as much as possible, and I finally realized that more communication is ESSENTIAL when caring for a new member of the family in addition to juggling the same old responsibilities. What I wish I knew before she was born…. Trust yourself. Yes it is all new and it’s a complete shock, but trust in your mama instincts. You will have them and they will be strong. There are a million parenting books, not because you need to be told what to do, but because everyone has their unique approach depending on their own personality and what meets the needs of their family. Do what it takes to feel like yourself. I truly felt so connected and in love with my pregnant body, but man the postpartum time is rough. I had to learn that it’s all part of the beautiful journey of motherhood, and while my clothes didn’t fit for a while (months), I had to do things to make me feel like my old self. Even just showering and blowing out my hair while the baby napped worked wonders. Do what works for YOU and your family! If you love quiet time or girl's night out, or jogging alone.... carve out a little bit of time each week to recharge. Ask for help. The best thing I did for myself as a new mom was admit that the anxiety I was feeling wasn’t normal, and ask for some medical help. Read all about that here. If you need help, ask. If you need a babysitter or a therapist or depression medication or just 30 minute of ALONE time, ask. Because you are a better mama when you take time for yourself. I could go on and on. It’s only been 12 months. 52 short weeks. My journey has just begun and I feel so blessed and lucky to be a mama. Please share your best lessons in motherhood with me! Comment below, or connect with me on social media. While each journey is different, I feel like I’ve learned so much from other amazing women. We can all use a little support. Happy birthday my beautiful Elle.